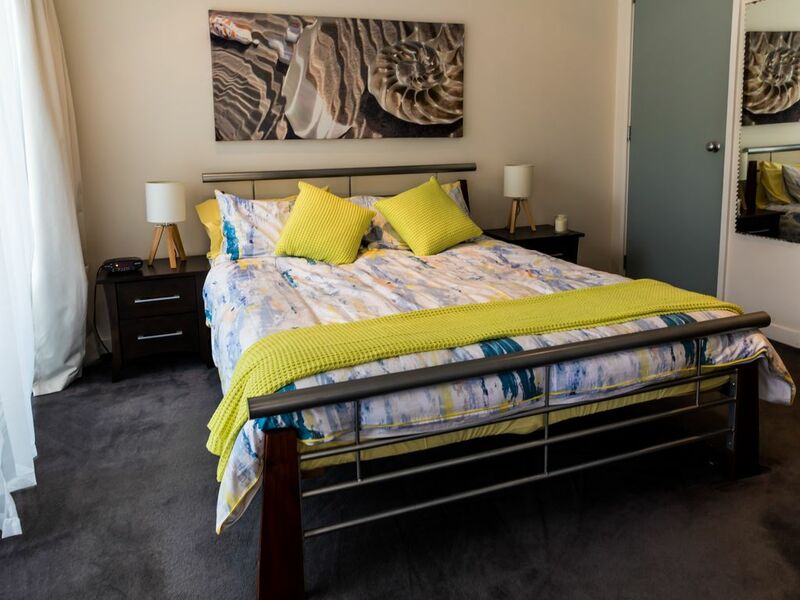 Offering great discounts for long-term stays, our cosy apartment is just perfect whether you're in town for the weekend or on an extended business trip. Set on a quiet, tree lined cul de sac, you have the vibrancy of the Viaduct with all its restaurants, night-life and attractions right on your doorstep. With a large patio, fully equipped kitchen, and 700 thread count sheets, you'll have everything you need for your home away from home. The bedroom is separate from the rest of the apartment. It has its own access to the balcony. Our linens and towels are all laundered by us, using fragrance free detergent meant for people with sensitive skin and allergies. You'll love our super comfy 700 thread count sheets, and plush towels! The full kitchen has been stocked with cooks in mind and includes the usual amenities, plus a great assortment of pots and pans and kitchen gadgets, so you can comfortably cook at home. You'll find the pantry has been stocked with some basic items as well. We've tried to think of everything - so you have everything you need for your home away from home, whether you are staying for a weekend or a month. Relax on the patio with a glass of wine or a cold beer and take in the relaxed city vibe. There are great cafes, restaurants and a small grocery within 100 metres of the building entrance, including Grand Harbour, our favourite dim sum restaurant is right across the street. A half block away is the waterfront with dozens more to choose from. There are three supermarkets within walking distance, though you may wish to grab an Uber or taxi home if you've done a big shop. You will have no need for a car, but should you have one, there is a public carpark about 75 metres from the building. Or, secure covered parking MAY be available by arrangement for an additional charge. Please note that the apartment is strictly NON-SMOKING, but the patio is covered and comfortable and if you do smoke, you are welcome to do so there. The bathroom has a great shower with wonderful water pressure. We've provided good quality grooming products, including body wash, shampoo, conditioner and other essentials. A full washer and dryer are in the bathroom, plus a drying a rack for drip drying delicates, and an iron and ironing board. The Residential Viaduct is probably the quietest urban neighbourhood in Auckland so it is generally quiet in the apartment. However, as the area includes restaurants, clubs and pubs, you can occasionally hear a bit of street noise, mostly on the weekend. Hi! I'm Sylvia. My mother, Veronica and I have two beautiful apartments on Auckland's Viaduct, which we rent out as holiday homes. We are both keen travellers and after renting apartments around the world, we decided to do it ourselves. Veronica is a professional photographer and free-lance writer. I work in menswear and am studying for my real estate licence. We love being hosts! Come and stay with us. My mother and I bought this apartment because we fell in love with it's homey charm, even though it is in an apartment building. It is beautiful and cosily comfortable and in a prime location. Veronica lives right across the street. There's a great shower, fluffy towels and a full supply of amenities included. The washer and dryer also have their own nook here as well. There is a four burner hob! Real cooking!!! The kitchen may be small, but includes all the mod-cons and equipment you'd expect to find at home. There is a ramp leading into the building so it's not necessary to use the front steps. However, as the keypad access is about 5 feet off the ground and there is a heavy fire door between the lobby and the apartment, I would probably not recommend it for someone who is wheel-chair dependent travelling alone. However, if the traveller has a companion, they will find the apartment amenable. Great location and the owner kindly accommodated an early check in request but it was downhill from there. The unit is in desperate need of updating and a really thorough cleaning. Things like big dust buildup on the headboard, baseboards, picture frames; greasy buildup on glass shelves in the kitchen area. Musty smell. Bed hard and uncomfortable. I stayed in several apartments in Auckland and this was the only disappointment. I ended up staying somewhere else for much of the time I had booked. Close to shops and fantastic restaurants. Lots of great places to see close by. The owners are really nice. Perfect.